Young people from Brooks Community School have collaborated with artist Larry Achiampong, with assistance from artist Barbara Lambert, to research and create artwork inspired by music that is shared culturally, as part of the One & Other project. Participants explored what a superhero is? How they came into being? And who can be a superhero? Superheroes were researched in relation to each participants’ culture and personal superheroes. They created their own superhero, developing a comic story and sketching out their likeness. 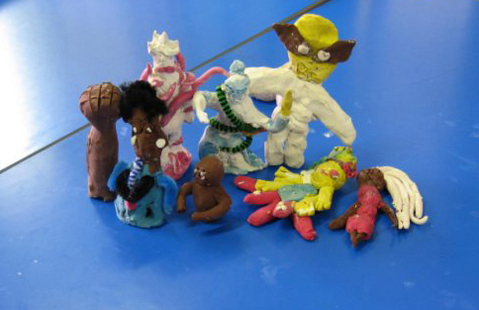 The superhero character was then made into a 3D clay model. From conversations and shared experiences participants recorded the superheroes’ stories, creating a short animation. They visited Iniva’s Stuart Hall Library to find out more and get an idea of where their work would be exhibited. They have designed an animation, contributed to a sound work and made 3D superheoes in clay. The results of their collaborative research and imaginations will be on show in the One and Other exhibition at Rivington Place from 22 April – 1 May 2010.